Showings start June 23, offers anytime June 27 or after. Welcome to East St. Paul. 1758 sq. 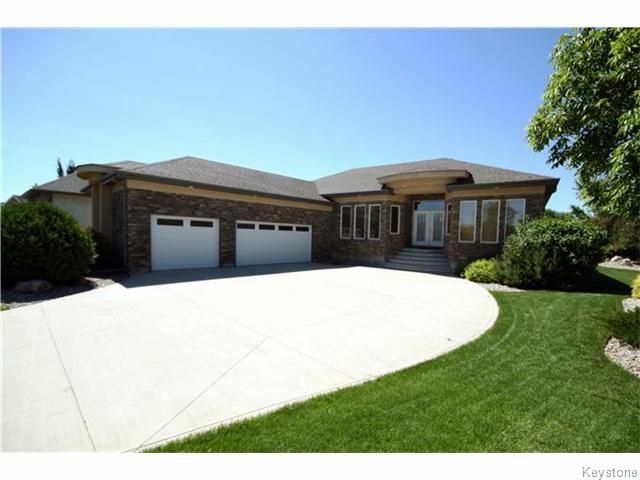 ft. 3 bedroom bungalow with triple attached garage on a beautifully landscaped lot. Great room with hardwood floors and stone faced gas fireplace, oak kitchen with island and breakfast bar, porcelain floors, large pantry, fridge, stove, dishwasher and microwave, garden doors to landscaped rear yard patio, dining room with hardwood floors, MBR with 5 piece ensuite featuring jetted tub and separate shower stall, walk in clothes closet, 9 and 10 foot ceilings. Built on piles, silent floor system and steel beam, central air, HRV, underground sprinkler, sump pump, 6 appliances and more.